Heat your fireplace and get out your coziest sweater - Winter is here! Whether you are happy about this or not, this great new craft book will have nearly everything you need to feel festive, despite the ice and snow. 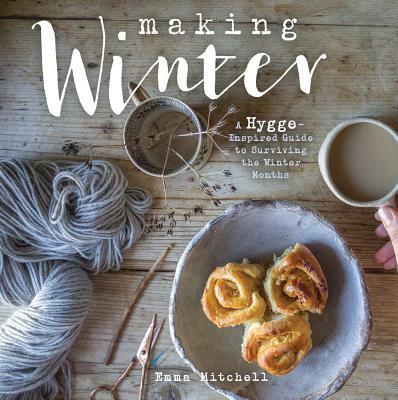 Inspired by the cozy, dreamy, idyllic danish lifestyle of "hygge," Making Winter is the perfect addition to any little homestead. Want to survive those dark and freezing winter months? The Danish do it with hygge--a concept that's all about coziness, simple pleasures, and the company of loved ones. Embrace this warmhearted philosophy with these 25 creative crafts and recipes, which range from gorgeous trinkets to snuggly woolens and tasty treats. You don't have to be an expert with a crochet hook or a whiz in the kitchen to complete the projects, which include easy-to-follow instructions and photographs. Make vintage ornaments, bake plum and orange blondies, crochet boot cuffs, and more--and you'll feel hygge warming you no matter how cold it is outside. Emma Mitchell is a popular designer, craft teacher, and naturalist. Her work has been published in Mollie Makes, Country Living, and Kirstie Allsopp's Craft. She has been featured in the Guardian and appeared on Alan Titchmarsh's Love Your Garden. Her Instagram account, silverpebble2, has over 80,000 followers, including Nigella Lawson and Nigel Slater.